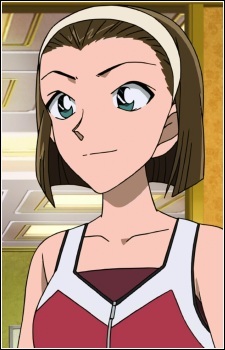 Suzuki Sonoko is the daughter of Suzuki Tomoko and Suzuki Shiro, the extremely wealthy family of a large company. She has a sister, Ayako, and an uncle named Jirokichi, who is often involved in trying to capture the Kaitou Kid. Sonoko and Mouri Ran have been best friends ever since they were little. Sonoko is often there to help Ran whenever she is bullied by other school children, more often there than even Shinichi was. Although Ran knows that Sonoko has a lot of money, she always makes sure that money never gets involved in thier friendship, not going to ski vacations with Sonoko because she doesn't have the money, when she knows that Sonoko would pay for her to go. This, along with other things, has helped strengthen the bond between both Ran and Sonoko. Before she began dating Kyougoku Makoto, Sonoko displayed the typical girl her age, acting very boy-crazy, and often mostly thinking about trying to snag the "perfect boy." She would often act sad because she couldn't get a boyfriend, using all necessary means to try and get one. She often dressed in clothes meant to attract boys, and would try to sweet talk her way into being with a boy, by making him chocolates, trying to impress a boy while wearing a bikini, or going to various events that young guys were going to attend. Ran, in the meanwhile, would always be the one to unwillingly attract the boys, which would cause jealousy in Sonoko. However, this all changed when Sonoko met and began dating Makoto.... well, not quite. She still flirts with boy sometimes, but in the end it's still Makoto that she likes. Sonoko often teases Ran, saying that Shinichi is Ran's husband, or things like that.